April 20, 2018 Anne J. You can imagine… You can also reimagine! 😃 Both are excellent undertakings and fun activities. I know, I like to focus on my own writing adventures when I can. I’ve already told you all that two of my short stories were published in Cinderella Reimagined. And, of course, there are plenty more opportunities to come. 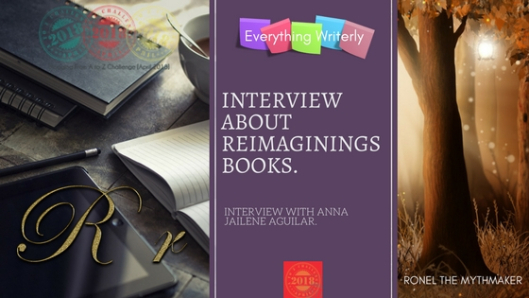 To explain that, I did an interview with Anna Jailene Aguilar. How did the Reimaginings Anthologies come to be? Reimaginings Anthologies, or Reiminagings Books, started with Cinderella Reimagined, thus, I would share how Cinderella Reimagined was born, although I am not sure anymore if the idea came about before or after I wrote my short story but Theresa J. Barker and I started chatting about writing our own Cinderella stories. Then, I suggested inviting fellow writers/bloggers to share their own Cinderella stories. November 28, 2017 December 31, 2017 Anne J. We have released Cinderella Reimagined: An Anthology of Cinderella Retellings and it is now available on Amazon, USA, UK and Europe. This signals the start of a new challenge. Theresa and I invite all writers and authors to submit their own take on Shakespeare's beloved MIDSUMMER NIGHT'S DREAM. We may have missed our in-time-for-Christmas target but our Cinderella anthology is out. CINDERELLA REIMAGINED: An Anthology of Cinderella Retellings is available on Amazon, USA, UK and Europe.